We can expect thundershowers, possibly with heavy rain, possibly with hail, every few days in the afternoon on our Outdoor Club summer Yosemite and Grand Tetons trips, or other mountain trips. During a lightning storm stay in a section of forest of trees the same height, not on a ridge, not under the tallest trees, not in a cave, under a rock overhang, leaning against a tree or standing on the exposed roots of a tree. In a campground, if a sturdy, substantial building is not nearby, a hard topped metal vehicle with the windows closed offers good protection. feet close together. Keep your hands off the ground. Do not lie flat on the ground!! which has a drawing of the lightning position. Crouch on something insulating if possible, such as your ensolite sleeping pad, or climbing rope. Even dry moss or grass or a snow patch is better than bare rock. Especially if you have to sit instead of crouch, get some insulation under your buttocks. Stay out of small depressions. Pick a slight rise instead. Not in standing water or a puddle. But mostly, pick a place quickly and get down, and stay down. Coaches: stay away from metal bleachers, railings, backstops and fences. Lightning can travel long distances through metal. Avoid dugouts, sheds. If a sturdy, substantial building is not nearby, a hard topped metal vehicle with the windows closed offers good protection. If in a building, don’t take a shower or use a sink, including washing your hands or laundry or dishes. Don’t talk on a land line phone. You can use remote controls, but don’t touch electrical equipment such as computers, TVs or cords. Do not sit of lie on concrete floors or lean against concrete walls or touch metal doors. If someone gets hit by lightning, or even nearly hit, they may be thrown a distance, so if they need ventilations (also known as rescue breathing and/or artificial respiration) you’ll need to treat them as a spinal injury and use a modified jaw thrust rather than head-tilt chin-lift. If you are out in the wilderness, away from quick EMS help, you might need to give ventilations for a whole hour or even longer. Don’t give up if they still have a pulse. NO, you won’t get electrocuted by touching someone who was hit by lightning. “Clearly the emergency treatment for a lightning victim consists of immediate, and sometimes prolonged, artificial respiration. (Cardiac resuscitation should be given also, if needed, but the heart most often resumes beating on it’s own.) Over seventy percent of the persons struck by lightning have enough disruption of brain function to lose consciousness. Recovery of enough function to resume breathing commonly takes as long as twenty to thirty minutes, and occasionally takes hours. paralysis that it is common with a lightning hit, and is usually temporary. Short term memory may be lost for a few days. Lightning moves at the speed of light: very, very fast. The sound of thunder moves a little slower (yup, at the speed of sound). If you count the seconds between when you see the light flash and when you hear the thunder and divide by 5 you will now how far away the lightning hits are. BUT thunder is only heard up to about 10 or 15 miles away. There is really no such thing as heat lightning, it is just regular lightning far enough away that you did not hear it. Lightning has hit from a storm 5 to more than 15 miles away, so you can be hit by lightning in an area where it is actually not raining. Why can’t you swim during a lightning storm? A strike on a lake doesn’t kill all the fish in the lake. Why don’t fish get fried by lightning? “…The best answer to Mel’s question we found comes from Don MacGorman, a physicist at the National Severe Storms Laboratory in Norman, Okla. When Sciencenetlinks.com asked him why fish don’t get fried by lightning, Don said it’s probably because they’re underwater. “Basically lightning stays more on the surface of the water rather than penetrating it. That’s because water is a reasonably good conductor, and a good conductor keeps most of the current on the surface,” he said. • You SHOULD get out of the water right away. 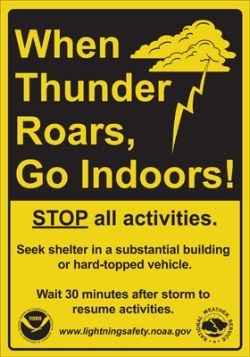 • Outdoors is the worst place to be during a thunderstorm. Quickly move indoors or into a hard-topped vehicle and stay there until well after lightning stops. • If you’re outside, make yourself the lowest point in the area. Lightning hits the tallest object. Crouch if you are in an exposed area. Stay away from trees. Lightning experts have stressed for years that using a land line phone, washing dishes or taking a shower, swimming in a pool/lake (even an indooor pool) is dangerous during a lightning storm, or even miles from the storm. Now we have discovered that talking on a cell phone, using a personal music player, beeper or lap top can also cause severe injuries. “Listen to an iPod during a storm and you may get more than electrifying tunes. A Canadian jogger suffered wishbone-shaped chest and neck burns, ruptured eardrums and a broken jaw when lightning traveled through his music player’s wires. A spokeswoman for Apple Inc., the maker of iPods, declined to comment. Packaging for iPods and some other music players do include warnings against using them in the rain. What is it like when lightning strikes? Park dispatch received a 911 call at 10:45 p.m. on August 1st reporting that lightning had hit a large lodgepole pine between two campsites at Bridge Bay and that 13 campers had been injured. A ranger in the area was on scene within minutes. Three of eight people in tents at the campsite located closest to the lightning strike were transported to Lake Hospital and treated for minor injuries; two of five campers who had been sitting by their campfire at a second site were treated at the scene and refused additional medical attention. One said that he was knocked off his feet by the strike. All 13 reported that they felt electricity from the lightning run through their bodies. The entire rear and side windows of a vehicle parked near one of the campsites were blown out, and a 40-foot section of the tree landed inches away from a tent occupied by three visitors. Additional debris from the strike was scattered in a 50-foot radius around the point where the lightning hit. Caught in a storm high on the Grand Teton, a team endures trial by fire and ice. “Lightning bolts near the summit of the Grand Teton struck three climbers three times Aug. 21, singeing jackets and skin as the men hunkered down and prayed for their lives. Dave Schwietert, 25, Fletcher Brinkerhoff, 28, and Mike Gauthier, 33, were within 200 feet of the 13,770-foot summit, tied to one another with a rope, when a storm rolled in. Schwietert said he saw the first charge strike. “I see this blue-green ball coming down the rope at me,” Schwietert said. “It was like the size of a beach ball. Then boom! It hit…. …”It went from Fletcher to Mike to me down the rope,” Schwietert said. The charge ran through the whole body, Brinkerhoff and Schwietert said. Gauthier said the sensation was of being electrocuted. “I felt as though someone was kicking me in the back of my head really hard,” he said. Schwietert hid in the nook with his partners, and Gauthier told him to take off caribiners and other metal objects. The bolt again hit a nearby rock, then bounced to Brinkerhoff, Gauthier, then Schwietert. Gauthier said the novelty of adventure evaporated. “The first one got my attention, the second and third one instilled the fear,” he said. Schwietert yelled to his buddies, “So much for what they say about getting hit by lightning twice!” Then he sat, held his head in his hands and prayed. Brinkerhoff said the second strike changed the situation. Brinkerhoff said he thought he smelled his hair burning after the second hit. The climbers talked about moving from their nook but decided higher was too exposed and lower was too risky. Then the third bolt hit. Schwietert said the ordeal lasted about 30 minutes. The team scurried to the top, then began a descent down the Owen-Spalding route. Once they reached the Lower Saddle, Brinkerhoff discovered what looked like a small cigarette burn on his jacket. The nylon burn was likely the smell after the second strike, Schwietert said. The bolt went through five layers of clothing. Brinkerhoff then found a burn on the top of his left shoulder. Schwietert said when he took his gloves off at the saddle, his hands were purple and his veins were prominent. “I think it was from the first strike when my hands were on the rope,” he said. In all, Brinkerhoff had four burns on his body: one on his shoulder, one on each ankle and one on his left shin. Gauthier had one burn on his back by his ribs that is more of a streak, Schwietert said. “Since Fletcher was the highest, I think he took the brunt,” he said. Schwietert said the incident won’t stop him from climbing but gave him a sense of his luck. ·	Secure outdoor objects such as lawn furniture that could blow away or cause damage or injury. Take light objects inside. ·	Shutter windows securely and brace outside doors. ·	Listen to a battery operated radio or television for the latest storm information. ·	Do not handle any electrical equipment or telephones because lightning could follow the wire. ·	Avoid bathtubs, water faucets, and sinks because metal pipes can transmit electricity. ·	Attempt to get into a building or car. ·	If no structure is available, get to an open space an squat low to the ground as quickly as possible. (If in the woods, find an area protected by low clump of trees–never stand underneath a single large tree in the open.) Be aware of the potential for flooding in low-lying areas. ·	crouch with hands on knees. ·	Avoid tall structures such as towers, tall trees, fences, telephone lines, or power lines. ·	Stay away from natural lightning rods such as golf clubs, tractors, fishing rods, bicycles, or camping equipment. ·	Stay from rivers, lakes, or other bodies of water. ·	If you are isolated in a level field or prairie and you feel your hair stand on end (which indicates that lightning is about to strike), bend forward, putting your hands on your knees. A position with feet together and crouching while removing all metal objects is recommended. ·	Pull safely onto the shoulder of the road away from any trees that could fall on the vehicle. ·	Stay in the car and turn on the emergency flashers until the heavy rains subside. Important: You are in danger from lightning if you can hear thunder. Knowing how far away a storm is does not mean that you’re in danger only when the storm is overhead.